When a force of nature tears through a region, no industry escapes unscathed, including the food industry. Most people recognize the destruction unleashed on farms and livestock, which makes up the most visible component of the damage. But damage to the food industry reaches much farther into the entire food production industry and supply chain. The food supply chain is complex, and a breakdown in one area can stall or derail critical processes. The domino effect a natural disaster causes can lead to further disruptions in crucial food safety systems and procedures if a facility does not have a plan in place. Manufacturers and processors of food for both humans and animals must consider the potential impact of a natural disaster on operations, processes and products. While a natural disaster can disrupt normal processes and even shut down just about every business in the area, processes that ensure the safety of food are never negotiable. Understanding natural disasters’ impact on food safety is the first step to being prepared if a devastating event occurs. There’s no doubt about it: Natural disasters are striking more and more often. Between 1970 and 2015, the incidence of documented natural disasters has increased more than fourfold. An incident is declared a natural disaster when it’s an earthquake, storm, flood or heat wave that results in 10 or more deaths or affects more than 100 people. The United States is especially disaster-prone, falling alongside India and China in the top three sufferers of natural disasters worldwide. In 2018, the U.S. experienced no fewer than 14 severe weather events that cost more than $1 billion each. Among those 14 disasters were the three most expensive catastrophes in the world that year. Judging from recent trends, this level of destruction seems to be increasing and preparedness is key. As extreme weather patterns continue to intensify, the food production industry faces increased chances of being affected by a natural disaster. The United States is home to approximately 57,000 food processors, and many of them are completely unprepared for catastrophe. Drought, floods and hurricanes all present unique challenges to processors and manufacturers. The growing severity and frequency of natural disasters mean the food production industry should put procedures in place that allow the continuation of operations that ensure the production of quality and safe food in the wake of a natural disaster and minimize any additional food safety risks. The following three disasters were so extreme most people are familiar with them. However, the actual impact of these events is even broader in scope than most people realize. They affected every human life and business in their region, including local food producers. Hurricane Michael: When scaling by pressure, this immense storm was the most intense hurricane to make landfall in the U.S. The Category 4 hurricane pummeled Mexico Beach, Florida, which was sadly unprepared for the devastation such a storm could bring. By the end of the storm, sadly 57 were dead and economic losses were growing. Assessors estimated the initial costs associated with Hurricane Michael to be about $16 billion, but we now know the actual cost reached more than $25 billion in total. Farmers alone bore more than $2 billion of that damage cost.Farmers in Georgia and Alabama reported livestock mysteriously dying or falling ill for up to four months after the hurricane. It is clearly still affecting livestock producers even now, many months after the fact. The saturated conditions mean animal feed inevitably gets wet and with that moisture comes the increased potential for contamination. This is the result of harmful microbes being introduced into areas they are not normally found, inflated numbers and the chance for contamination.The animals may also be at risk for developing diseases from insects they would not normally be exposed to while they temporarily live in wet and saturated environments not capable of providing the normal quality of feed, water and care. The aftermath of a hurricane is always unpredictable, and unfortunately, threats to food safety don’t stop when the storm does. Preparing for a natural disaster requires forethought of the immediate aftermath, as well as risks that take can longer to appear and address. Hurricane Florence: This hurricane made landfall in September 2018, just a month before Hurricane Michael’s wake of devastation. Florence battered the Carolinas, bringing winds of up to 130 mph and cataclysmic levels of freshwater flooding with it. In addition to 51 fatalities from the storm, estimated losses totaled more than $24 billion.The Carolinas have a robust food processing industry, primarily working with meat and poultry. To prepare for the disaster, the state of North Carolina reached out to swine and poultry producers in an effort to move animals out of the area prior to the storm. About 20,000 pigs and 1.5 million poultry were moved to other farms or sent for processing. Despite this preparation, 5,500 swine and 4.2 million poultry animals died and more than 550 buildings in just those two industries suffered flood damage.Flooding is one of the worst disasters food producers can face because a damp environment makes an ideal condition for bacteria already present to reproduce exponentially and types of bacteria that are not normally present to be introduced. Floods also tend to administer a wide path of damage to crops and livestock making it extremely difficult to salvage any remaining food materials that are safe for consumption in the aftermath of such a disaster. California wildfires: The wildfires that swept California in 2018 are best known for their shattering impact on homes and human lives. The campfire in the north of the state reportedly killed 85 people and destroyed 14,000 homes. To provide relevance on a more recognizable scale, you could fit all of Chicago inside the burned geographic area.Not surprisingly, agricultural producers in that area suffered immensely. Fruit, lettuce and avocado farms, in particular, sustained major losses, with some farmers losing up to $35,000 per field. California’s food packaging industry also suffered from the interruptions in the food supply chain. Food processing is a $200 billion business and the direct employer of 190,000 workers in California. Although nobody has tallied the costs to reflect the damage to the food processing industry alone, the immense financial impact that has been incurred is undeniable. As the previous examples indicate, a natural disaster interferes with the food supply chain at every level, starting with agriculture. When a catastrophe occurs, the physical damage sustained directly by the agriculture industry alters the entire supply chain. These examples illustrate just a small portion of the specific impact disasters have on the food production industry. Assess damage: Disasters destroy many of the fundamental assets of the agriculture sector. The impact of natural disasters on the environment can be devastating. Crops may burn, grain reserves may get contaminated by floodwater and livestock often dies. In some cases, seed stocks even get destroyed, causing farmers to lose many future months’ worth of potential product in addition to other numerous asset losses. For food processors and manufacturers, this typically means a significant and sudden increase in raw material costs due to the sharp reduction in supply. Infrastructure damage: Destruction or damage of necessary agricultural structures often results in issues stemming from a reduction in quality control. For example, when irrigation systems fail they compromise the quality of any remaining crops. If a refrigerated storage facility experiences extended power outages, they often lose entire lots of product. If a flood breaches a livestock facility, it can result in the animals drowning or being exposed to a host of pathogens. Infrastructural damage usually means food producers must pay even closer attention to the source of their raw materials and act quickly to identify the possibility that pathogens have a higher potential to enter the food supply chain due to the effects of a natural disaster. Transport damage: When a road gets washed out or a tree falls across a railway track, that delay has a domino effect throughout the food supply chain. In some cases, the communication systems used to coordinate transportation are not functional either, causing chaos and problems to ensue. A breakdown in transportation due to a disaster can lead to foods and ingredients spending longer than they should in transport and possibly being exposed to a temperature range between 40 and 140 degrees Fahrenheit, which is commonly considered the “danger zone” for many food products because those temperatures allow increased growth of microbes that are potentially harmful. As a processor, the impact of transport damage increases the need to be vigilant about the possibility of contamination to food products. All the hurdles involved in recovering from a natural disaster challenge producers’ ability to operate at usual standards and efficiencies. Damage to buildings and equipment can derail the typical processes your facility uses to ensure the quality and safety of your products. Employees perform worse in extreme weather and disasters, creating a potential element of human error. A single mistake is enough to result in consumers receiving contaminated product. You already work hard to ensure food production safety; Facing the possibility of a natural disaster can be terrifying. If you are unsure where to start with natural disaster preparation for your facility, here are four things you can do to help alleviate possibilities of production disruption and the potential for pathogen contamination. Organization is a key element in preventing contamination in your food production facility. Just as it’s essential for customers to know what ingredients are in the product they receive, it’s crucial for a food processor to know when their ingredients arrive and from what location. If a food manufacturer uses chicken from two different sources, it’s crucial to label and store them accordingly so the traceability allows each to be identified, especially in the event product would have to be recalled due to issues arising from a natural disaster. 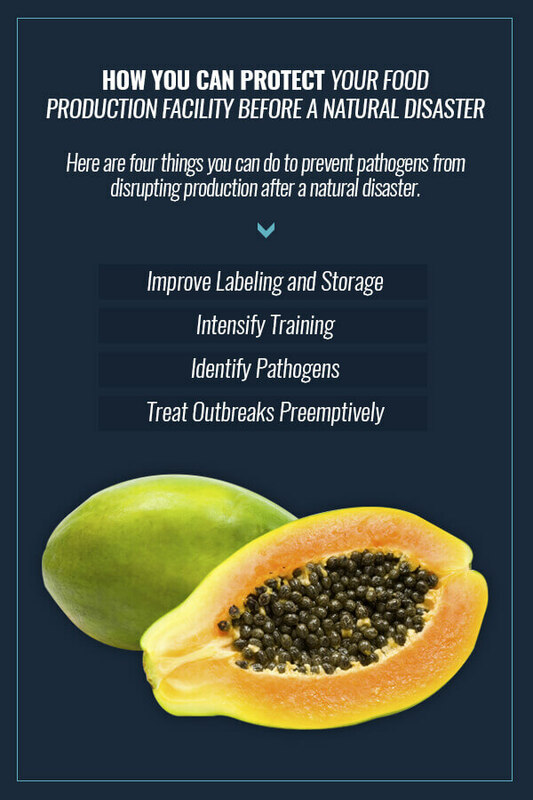 For example, if one of the companies contacts you after a natural disaster identifying serious concerns of contamination, such as Salmonella, organized and properly labeled ingredient storage will make it much easier to remove the at-risk ingredients before they are introduced into product with minimal impact on normal production schedules. Human error is the most unpredictable element in maintaining the production of safe and quality food. It has been shown to increase significantly in companies after being affected by a natural disaster. It should be expected that employees would become extremely tired and distressed from the impact a disaster forces on their lives. Their state of mind can make them much less likely to absorb any new training, especially considering they may be expected to be trained on and implement new or altered procedures in the chaos of a natural disaster. Training employees to be compliant with Food and Drug Administration (FDA), United States Department of Agriculture (USDA) and Food Safety Modernization Act (FSMA) regulations can be rigorous and time-consuming. However, employees are usually the first line of defense against any food safety or production concerns. The need for adequate training before a disaster strikes is important to maximize employees’ ability to perform sufficiently when a natural disaster does occur. Successful training in producing safe and quality food ensures all employees are aware of expected standards such as personal hygiene, equipment sanitation and the consequences of a deviation in procedures. There is no one-size-fits-all food safety training program. Every facility has different needs depending on its size, purpose, products, climate, location and other factors. One of the most common training programs that is utilized in food safety is Hazard Analysis Critical Control Point (HACCP). This training is important because it uses provides methods to analyze and have the most control over physical, chemical and biological hazards that could be present or introduced in the food production process. The most beneficial training programs, such as those offered by Log10®, have gone through the necessary steps to attain certifications from organizations such as the International HACCP Alliance. Pathogens represent a massive risk in food quality and safety. One of the most significant impacts of a natural disaster is the increased risk of contamination from raw materials utilized in food processing. Front line defense against food contamination often comes from farmers and growers of the food and ingredients. However, relying on them entirely in the event of a natural disaster can expose your facility to undue risk. Legislative requirements dictate common food safety standards and protocols. Analytical lab testing, including microbiological analysis of food products before they make it into commerce and onto store shelves, is a responsible way to reduce the chance of accidentally releasing an adulterated product into commerce. Being proactive, sampling food products and the production environment and providing a complete environmental monitoring program is one of the primary ways to prevent any contaminated food from potentially being released during or after the hectic times associated with a natural disaster. One example of this beneficial practice is the microbiological testing of meat and meat products. Ground meat notoriously has the potential to be contaminated with E. coli or Salmonella. A microbiological test can identify indicator organisms or even specifically the pathogens, making it a vital step in preventing or mitigating any recalls or associated foodborne illness outbreaks. Analytical lab testing is an umbrella term, covering microbiological testing as well as analysis of chemical compositions and physical characteristics of food products. This comprehensive and customizable suite of tests provides a panel of information about your product and can identify potential issues with indicator organisms or even contamination from pathogens prior to release of the product, reducing the chance for a withdraw or recall situation. In recent years, regulations and technology have allowed safe food production to advance and benefit from the development of preventive measures in an effort to stop potential foodborne illness outbreaks from happening, as opposed to simply reacting to an illness outbreak after it has already affected the community. Log10® has developed a novel solution for food processors that provides an alternative treatment and a layer of protection from dangerous pathogens. Pre-Liminate™ is a custom probiotic blend, providing food processors with tailored formulations that meet the individualized needs of the facility and products produced and provide elimination or even prevention from specific microbes. Many people are familiar with the concept of probiotics as they relate to the digestive system of animals and humans. They are typically referred to as “good” bacteria, while “bad” bacteria that can result in illness are commonly called pathogens. Introducing Log10® probiotics into food products and the processing environment (including food contact surfaces) encourages a transition from the pathogenic biofilms that may be present towards a more beneficial microbiome rich in probiotic bacteria. Log10’s Pre-Liminate™ probiotics have the unique ability to remediate issues of common pathogens found in food processing facilities, including but not limited to multiple species of E. coli, Listeria, Salmonella, Clostridium and Staphylococcus aureus. Every facility and food product is unique and each probiotic blend is able to be customized to fit your specific needs. Pre-Liminate™ products are made entirely of food grade ingredients that have been declared Generally Recognized as Safe (GRAS). This means these ingredients are able to be included in food processing environments, food contact surfaces and even directly into the food products. The prospect of a natural disaster raises a multitude of questions for any food producer. Log10 is a full-service food safety company which includes expert consultants and trainers that are committed to helping companies provide safe and quality food products. We can provide the expertise you need to ensure your business is compliant with all applicable regulations through our suite of products and services. Log10 offers companies consulting and training services, quality control options, individualized research studies and programs, product testing, and pathogen mitigation and prevention. Our goal is to help companies ensure the safety of all food introduced into commerce. Contact us if you have questions about how you can maintain compliance with FDA, USDA and FSMA regulations. We understand that producing quality and safe food is vital to your company, and we’re able to provide the expert consultation, services and products you need to maintain that goal.